Published on 13. 09. 2013 in comics and cartooning, commentary and criticism and hype & linkage. 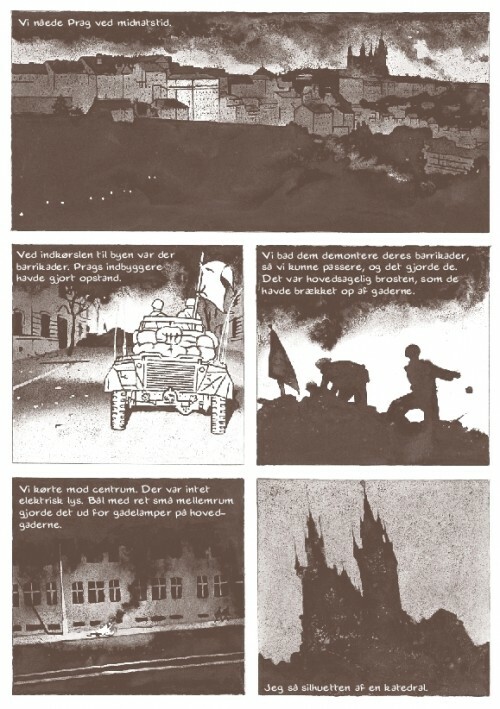 Closed Tags: Aben maler, Alans krig, Emmanuel Guibert, Information, La Guerre d'Alan. I Informations bogsektion har jeg i dag en anmeldelse af Emmanuel Guiberts mesterværk Alans krig. Læs den! Published on 23. 12. 2012 in comics and cartooning, journal and music. Closed Tags: André Franquin, Clyde Stubblefield, Emmanuel Guibert, John "Jabo" Starks, Questlove. I recently gave a talk on Franquin at a library seminar. I kind of went on a tirade to express my great appreciation I have for certain people, and especially him. This was a guy who, to me, lived his entire life, without filter. He endured perpetual and tremendous nervous stress because of his great sensitivity. Everything resonated with him: people, plants, animals, architecture… everything that surrounded him clearly affected him, haunted him, obsessed him… Naturally, this resulted in episodes of great melancholy, but this is how it had to be. When you have this human quality, which to me borders on the martyrological, there is inevitably an aspect of sacrifice. To capture the world, making the effort to do so when you’re possessed of a nervous temperament such as his, is restorative. Franquin’s nervousness is something singular. 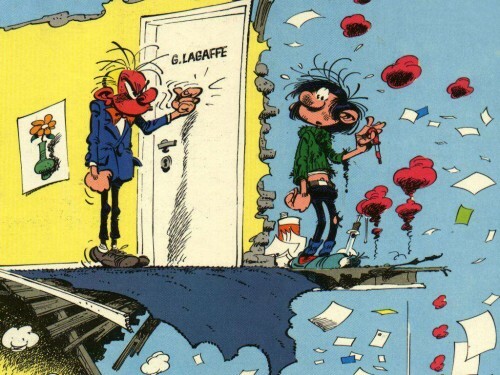 When you read Gaston Lagaffe or Spirou with an understanding of its aspect of frustration, of repetition, of the wear and tear of daily life (that one never succeeds in signing a contract, for example [a reference to a running gag in Gaston])… all this explains the grinding of teeth, the difficulties his characters have with fitting in… and at the centre of all this, it felt natural for Franquin to place the character Gaston, who — in contrast to himself — remained entirely unaffected. I think it would be worthwhile to write about all this. Perhaps I’ll do so one day, but it’s amazing how far it goes. And I think this explains the intensity of the passion some people have for comics. (The imperfect translation is mine). Next up is drummer and anchorman of the hip hop band The Roots, Questlove, ostensibly on Rob Base and DJ E-Z Rock’s classic “It Takes Two”, from his enjoyable list of fifty favourite hip hop cuts from the beginnings to his own professional debut in 1995. What an occasion to talk about James Brown’s drummers? For all of the James Brown/Clyde Stubblefield “Funky Drummer” sample folklore talk out there, I rarely hear conversation about the James Brown drummer who actually got sampled more than my idol Clyde did. John “Jabo” Starks was the Beatles to Clyde’s Stones. A clean shuffle drummer to Clyde’s free-jazz left hand. Clyde fit more with Public Enemy’s pop-art-rock sporadic vision. Emphasis on everything surrounding the one beat, thus making other parts of your body shake in order to keep up with his rhythm – see “Mother Popcorn,” “It’s A New Day” and “Give It Up or Turn It Loose.” Jabo’s sparse, all-on-the-one funk was more at home with conservative soul lovers – see “Hot Pants,” “Escapism” and “The Payback” – which is why it makes total sense that Clyde’s panic style was the anchor to drum and bass music and other experimental styles, while Jabo was the anchor of the New Jack Swing movement. He was always reliably on the one and never, ever in the way. Jabo’s go-to magnum opus was on the five-break-filled JB-produced “Think (About It)” by Lyn Collins. James’ holy ghost yelp almost threatens to upstage Starks’ show, but it’s Starks’ steady glide that gave R&B music its blueprint some 15 years after its release.